Romualdo Segurola, MD, FACS, has joined Jackson Health System, leading a renowned cardiac surgery team at the new Jackson Heart Surgery Institute with offices in Doral. Jackson Health System has the most comprehensive heart program in Miami, with cardiac care available to patients of every age – from pediatrics to adults. Benefits typically include less pain, faster recovery, and fewer scars. You can trust our highly experienced multidisciplinary team of physicians, part of our Jackson Medical Group surgeons. We offer access to advanced technology and new clinical trials. We are one of South Florida’s most experienced cardiac surgery teams, treating more than 50,000 patients in the past 15 years. If you are concerned about the health of your heart, contact your primary care physician, or call the Jackson Medical Group at 305-585-4564 for a private consultation. Community physicians can refer patients in need of specialized cardiac or thoracic care to Jackson Heart Surgery Institute for a comprehensive evaluation. Call our physician line at 305-585-4HRT or fax to 305-406-3599. Our multidisciplinary team is your partner throughout every step of the patient journey. We offer comprehensive care for your heart, from initial evaluation and diagnosis to non-surgical and surgical treatments, to ongoing management of chronic conditions and transplants for end-stage disease. Our surgeons utilize the latest technology, including robot-assisted surgery, and conduct clinical trials of new medications and devices. In addition, our Institute combined with the unmatched multidisciplinary teams of Jackson Health System are an important consideration for patients with underlying conditions or multiple medical problems. Efren Buitrago, MD, specializes in cardiothoracic surgery, peripheral vascular surgery, and thoracic surgery. Dr. Buitrago has expertise in endovascular management of aortic disease. He is board certified by the American Board of Surgery and the American Board of Thoracic Surgery. He is a fellow of the American College of Surgeons and member of the American Medical Association, the Cardiothoracic Surgery Network CTS, the American College of Chest Physicians, the International College of Angiology and the Eastern Cardiothoracic Surgical Society. Dr. Buitrago is also clinical assistant professor of Nova Southeastern University and Ross University School of Medicine. He participates in proctoring programs to educate physicians on endovascular technologies. He is also engaged in research to enhance patient care and has published many manuscripts in peer-reviewed journals. Dr. Buitrago earned his medical degree at the Universidad Nacional de Colombia. He completed his residency in General Surgery, followed by a fellowship in Cardiothoracic Surgery at Jackson Memorial Hospital in Miami, FL. Previously, Dr. Buitrago was the medical director of The Vascular Institute at Palmetto General Hospital and a cardiothoracic surgeon of The South Florida Heart and Lung Institute and The Heart Institute at Palmetto General Hospital. 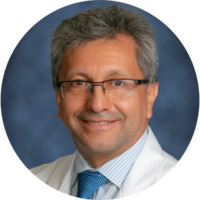 Romualdo Segurola, MD, FACS, is triple board-certified in general surgery, trauma/critical care surgery, and thoracic surgery. He specializes in cardiac and thoracic surgery with expertise in coronary artery bypass surgery, thoracoscopy-assisted surgery for atrial fibrillation, aortic root reconstruction, minimally invasive valve surgery, and treatment options for end-stage heart disease. In addition to his full-time clinical practice, Dr. Segurola dedicates time to research, participating in leading-edge clinical trials of pharmaceuticals and devices. His articles have been published in prestigious medical journals, and he has contributed book chapters to different published works. Dr. Segurola has presented lectures to medical professionals and societies around the world, including the American College of Surgeons, the American College of Chest Physicians, and the International Society for Heart and Lung Transplantation. He is also an active member of the National Spokesperson Panel for the American Heart Association/American Stroke Association. After finishing medical school, Dr. Segurola completed a research fellowship in vascular/molecular biology at Yale University School of Medicine, followed by a surgical residency at UMDNJ-Rutgers School of Medicine. He then completed three fellowships in Trauma & Critical Care at Ryder Trauma Center from the University of Miami School of Medicine and Cardiothoracic Surgery and Heart & Lung Transplantation at the University of Minnesota School of Medicine (Lillehei Heart Institute), considered the birthplace of modern heart surgery. 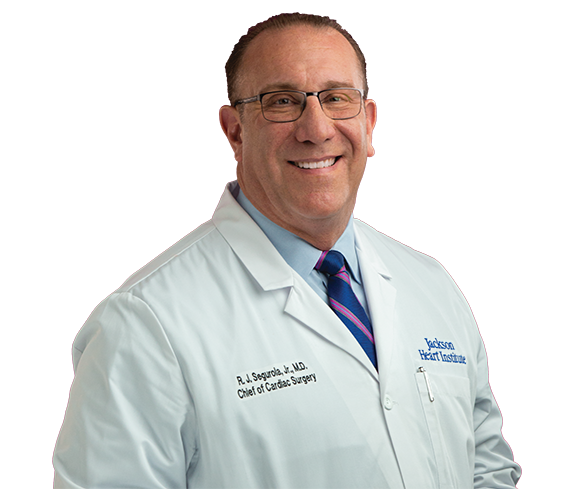 He returned to his roots in South Florida in 2004 and was formerly chief of cardiac surgery for Palmetto General Hospital and chief of cardiopulmonary surgery for Mercy Hospital. Dr. Segurola joins Jackson Health System as a Jackson Medical Group physician in April 2019. He is named chief of cardiac surgery for Jackson Health System, medical director for Jackson Heart Surgery Institute, and medical director for cardiothoracic surgery for Jackson North Medical Center and Jackson South Medical Center. He is leading the new Jackson Heart Surgery Institute, which brings together two of the most trusted names in the community to form Miami’s most comprehensive heart team. 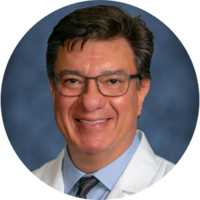 Alfredo Rego, MD, specializes in cardiothoracic surgery, peripheral vascular surgery, endovascular therapies and minimally invasive and robotic surgery. He is board certified by the American Board of Surgery and the American Board of Thoracic Surgery, and a fellow of the American College of Surgeons, American College of Cardiology, and the American College of Chest Physicians. He is also a clinical assistant professor at Nova Southeastern University. Along with his full-time clinical practice, Dr. Rego is dedicated to research and participates in clinical trials to enhance the quality of care for his patients. He has also had book chapters and reviews published, along with many published manuscripts that have been reviewed by his esteemed peers. Dr. Rego earned his medical degree at the University of San Carlos in Guatemala, followed by a surgical residency in general and vascular surgery at Ohio State University in Columbus, Ohio. He completed a Ph.D. in Cardiovascular Physiology & Biophysics at Georgetown University School of Medicine in Washington, D.C. 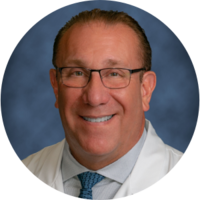 Previously, Dr. Rego was chief of thoracic and vascular surgery at Palmetto General Hospital, and medical director of vascular surgery services. He was also the co-chairman of the Department of Cardiac Surgery and vice chairman of the Department of Surgery at Aventura Hospital and Medical Center. Vice Chief of the Department of Surgery by Aventura Hospital & Medical Center in 2008. Choose the experienced team at Jackson Heart Surgery Institute – home to Miami's most comprehensive health system and the best surgeons for your heart.